Is it just me or does Sweden make some of the best films ever? Like Let the Right One In, and now The Girl with the Dragon Tattoo (2009). This film, surprisingly, had a twelve week run at the local cinemas--which is almost for as long as Avatar ran for. It's easy to see why the people were flocking to see it. The Vanger clan were shocked by the disappearance of Harriet Vanger in the 1960's, and her uncle has wanted to know what happened to her and why her body was never found. He enlists the help of journalist Mikael Blomkvist (Michael Nyqvist) to investigate the murder. 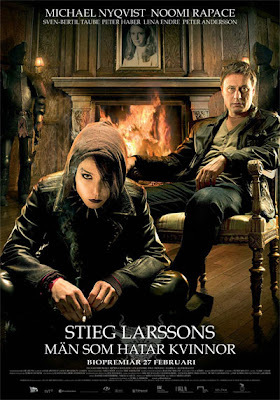 Mikael finds out about a young computer hacker Lisbeth Salander (Noomi Rapace) and asks her to help him with this case. What they find is more shocking and violent than they bargained for. This film is a masterpiece of the crime genre, a fine one, may I add. It is engaging, boosted by a masterful performance by Noomi Rapace. Who ever said a movie derived from a book can't be that great? Well, I haven't read the books, but I am certainly looking forward to the sequels to this film to be released--if they ever are. European film is morphing into the better side of American culture, so America, watch out, The Girl with the Dragon Tattoo is after you.